Professional treatment for inhalant addiction. While most parents are not worried about cocaine or heroin lingering in their home, they do not realize that another potential addictive substance is probably readily available to their teenagers – inhalants. Because they can be extremely addictive and lead to long-term health issues, it is important to know about the signs of abuse so you could recommend treatment for inhalants if that were necessary. When it comes to the popularity and dangers of inhalant use, most parents are left in the dark. Teenagers and other abusers meanwhile have found that this is one of the easiest ways to get high, the substance is easy to hide, and inexpensive to obtain. Especially among younger Americans, the number of individuals who admit to having tried inhalants before has skyrocketed. So What is Inhalant Use? This leads to the question of what the actual substance is, how people abuse it, and what it does. It refers to intentionally breathing vapors or gas, with the sole purpose of attaining a high. Even though these inhalants are often legal to buy, they can clearly be misused. Some of the examples most people are a familiar with – glue, paint and more – while other products people have probably never heard of before. However, this does not make them any less dangerous when abused. A few examples include butane, air freshener, spray paint, felt tip markers, air-conditioning refrigerant and typewriter correction fluid. There might be upwards of a thousand different options. What is the Population at Risk? According to the National Household Survey on Drug Abuse (NHSDA) from the Substance Abuse and Mental Health Administration (SAMHSA), almost 2 million young Americans between the ages of 12 and 17 had abused inhalants before. Overall, the number of Americans who have experimented with inhalants stands at around 18 million. Between 6th and 7th grade, the use of inhalants ranks at number four behind only alcohol, cannabis and tobacco. Because of the perception of innocence, young adults may use these inhalants to experiment. This means that they are getting their first experience of being ‘high’ with an affordable, available product. This is only going to increase the likelihood that they will use again in the future. Knowing that, it seems even more incredible that according to the Parent Attitude Survey (PATS) done by the Partnership for a Drug-Free America, few parents are aware of what inhalants are, most do not know what inhalant abuse is, and would not know where to turn for the professional treatment for inhalant abuse. While 18 percent of teens between ages 12 and 17 reported trying inhalants before, only one percent of the parents believed that their child has tried inhalants before. Perhaps even more troubling is the fact that most parents will discuss other drugs such as crack, cocaine, heroin and marijuana, but not talk about inhalants. Another problem is that those needing inhalant treatment are not receiving the necessary help. According to NHSDA, out of the 141,000 people who might need inhalant abuse treatment, about half are between ages 12 and 17. 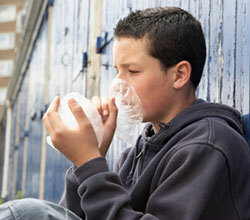 There is no other substance with a higher percentage of youthful abusers in need of treatment than inhalant abusers. The number of patients who actually receive inhalant addiction treatment is about 1,272. Even though prevention is always the best option, the truth is that identifying the problem and intervening to ensure that the person can receive inhalants treatment is the best way to stop inhalant abuse. Depression, irritability, lack of coordination or inattentiveness. Appearance of being drunk or disoriented. Chemical-soaked rags or clothing and hidden empty spray paint or solvent containers. Paint or other stains on hands, face or clothes. Chemical odors on breath or clothing. There is a variety of other short-term effect in the different types of inhaled products. Some might include vomiting or nausea. However, there are serious long-term consequences as well. These may include bone marrow damage, hearing loss, kidney damage and liver damage. Damage to the myelin may also lead to a loss of coordination and limb spasms. By cutting off the flow of oxygen to the brain, inhalant abuse may even lead to brain damage. In rare cases, the use of inhalants can become fatal. Sniffing these highly concentrated amounts of chemicals that you find in aerosol sprays or solvents can lead to heart failure in mere minutes. This is referred to as “sudden sniffing death,” and might even cause death in an otherwise healthy young person after a single session of inhalant use. It is also possible that using in a closed area or inhaling from a paper or plastic bag can lead to death from suffocation. Despite the fact that these are common household items, the abuse can be both psychologically and physically addictive. Especially after continued usage over many days, those who abuse these substances report a strong urge to continue using inhalants. Only furthering the need for professional inhalant addiction treatments is the fact that users can experience withdrawal symptoms after prolonged use, these may lead to hallucinations, shaking, agitation, chills, headaches, muscle cramps, excessive sweating and nausea. In some of the worst cases, it may lead to convulsions. If you believe that you or someone close to you struggles with dependence on inhalants, rehab for inhalants may be necessary. This is the best way to give yourself or someone else a chance not only live a sober life, but also avoid problems with future substance abuse. Long-term inpatient inhalant addiction treatment gives users a chance to live a sober life, but also gives them a solid base on which they can build in the future.